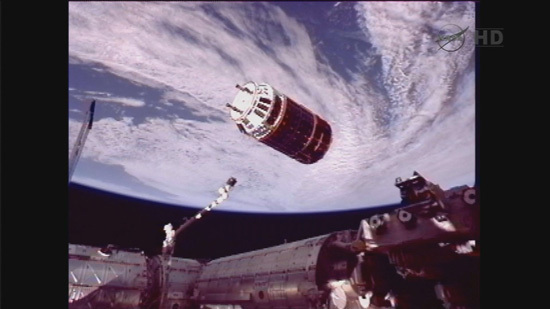 The Kounitori-3 (HTV-3) was captured by the ISS robotic arm at 9:23 p.m. on July 27 (Japan Standard Time) and berthed at the ISS at 2:31 a.m. on July 28. The Kounitori-3 was launched by the H-IIB Launch Vehicle No.3 on 21 July. ISS astronauts will take cargo out from the Pressurized and Unpressurized Logistic Carriers into the ISS. Hatch Open to Kounitori. Ready for Cargo Transfer. 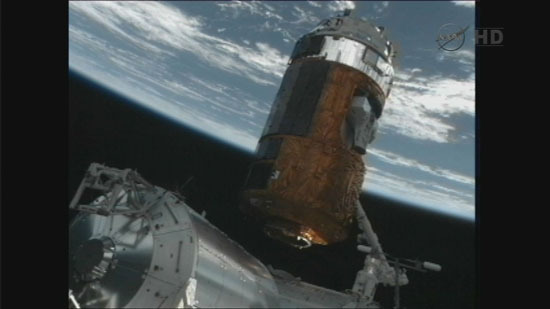 Additional images of the HTV-3 mission can be found here. At 6:36 PM Phoenix time (0136 UTC 21 July), we are at T-30 minutes and counting. All systems are go. Weather is showing some lightening in the area but no concern at the moment. Launch. All systems are nominal. The H-IIB launched into the low clouds. At T+2:10 the boosters have separated. Flight is smooth at 3 minutes into the flight. Fairing separation confirmed. 16 minutes into the flight and Kounitori-3 is on her way to the International Space Station (ISS). 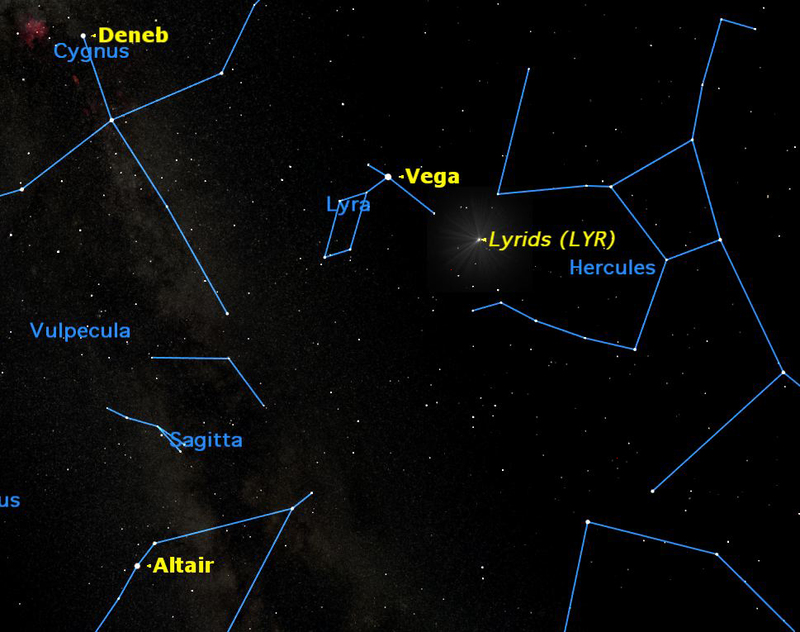 Docking is expected to occur on 27 July with the Harmony Node. 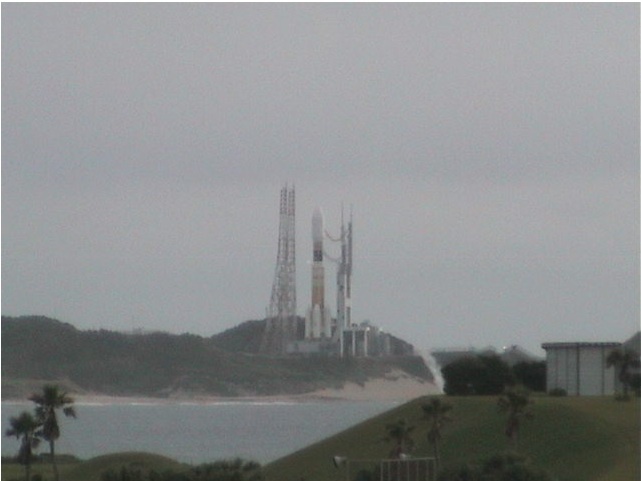 At 8:00 AM Japan Standard Time (JST) (1700 UTC), the H-IIB launcher was quietly counting down toward liftoff, currently scheduled for 7:06 PM Phoenix time (0206 UTC 21 July, 11:06 AM JST). 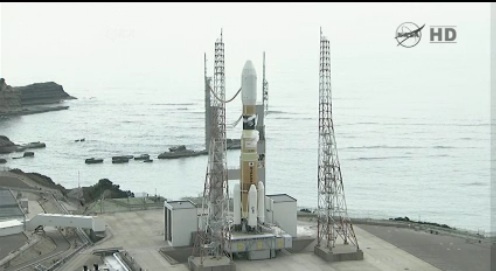 You can find updates at the JAXA web site, or follow the launch live on NASA TV, beginning at 6:15 PM Phoenix time. We are now at T-2 Hours until launch. Science has been a part of the Space Shuttle Program from the very beginning. The Most recent mission, STS-134, was no exception. Endeavour, making its final flight, carried a pallet of micro gravity experiments created by students from around the United States. Veronica Ann Zabala-Aliberto from Rancho Santa Fe Elementary in Litchfield, Arizona, spent more than a month at NASA’s Kennedy Space Center in Florida helping to set up and analyze the experiments. 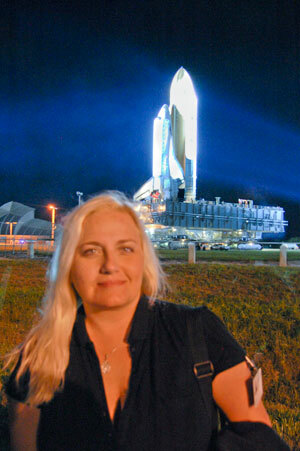 She was responsible for loading the experiments for the flight aboard Endeavour, and for retrieving the experiments once the space shuttle had landed. Videos showing the lab work can be seen on ustream, and a description of the program is at STEMStream TV. Student teams submitted 447 proposals, from which 16 were selected—one for each community. You can visit the SSEP Community Network Hubsite for the list of winning proposals. And a second Student Spaceflight Experiments Program opportunity was created when STS-135 Atlantis was added to the space shuttle flight manifest. Veronica is the Arizona regional coordinator for the Planetary Society, at-large director for the National Space Society, president of the Arizona regional coordinator for the Planetary Society, at-large director for the National Space Society, president of the Phoenix chapter of the National Space Society, commander of the Family Living Analysis on Mars Expedition and co-founder of the non-profit organization, Astronauts4Hire.